I'd be interested in hearing opinions of the pros and cons of each type of supplementation system, Calcium reactor based and 2-part solution based. From what I'm looking at, if I understand it right, there's no reason to not go with a reactor. In a 2-part system, by the time you get done with the dosing pumps, timers, and making the solutions, you've spent as much as a reactor and co2 system. Did I miss something? Are 2 part systems more healthy for the tank, or is the attraction that you can start out with nominal cost and then later get more sophisticated by adding the dosing pumps, where the cost of a reactor is all front-loaded? "Following the path of least resistance is what makes rivers, and men, crooked." 2) Even with the purchase of a Litermeter and a second pump it was still much cheaper than a reactor. With the cost of a reactor you can't forget about CO2 tank (extra tank), pH controller, cost of media and a good quality regulator in addition to the reactor itself. For those that switch from 2 part to CA reactor, do you also dose an additives? I've used Bionic 2 part and it includes trace elements that I'm assuming you don't get from a reactor. Not a hijack at all! This was going to be my next question. My understanding is that certain reactor media, depending on the manufacturer, often contains trace elements like Mg and other stuff. I think the Korallin media is highly recommended for this reason. ca reactor all the way! i'll never go back to dosing 2 part. its a PITA. Current Tank Info: 2 gallon goldfish bowl with a happy 7" Naso tang and 2 small Beluga whales. Just added a baby dolphin, large Trigger, a herd of Sea Horses and just fragged my first Manatee. All fish safely hand caught using organic cyanide. I will agree with that only if you are dosing it manually. I am going 2-part this time, and will be purchasing a Litermeter3 soon. I have ran both systems and I find that I can maintain much more stable Cal & Alc levels with the 2-part. Also better / higher PH. good luck finding a liter meter. they are out of stock everywhere till mid to late june. as for the higher PH. i add kalk to my top offwater to help in that department. I've run both. I prefer the 2-part, if it's automatically dosed. I use a peristaltic, and would never go back to using a reactor. No more worrying about co2 levels, pH, etc. Just refill my gallon containers once a month, and that's it. I've run both as well, and, on a smaller tank (less than 100gallons) I would just do the 2 part. Smaller less demanding tanks are a breeze with a 2 part. However, after the initial costs and setup of a CA reactor, it may be cheaper to run in the long run than a two part system. The only thing I hated about a CA reactor was the constant tweaking of the regulator/bubble count. Moreover, one good thing about a reactor is you really can't overdose your tank and/or spike the PH too high too fast. If you make your own 2 part its very cheap.A 50 pound bag of dow flake can last you a long time.The baking soda is cheaper if you buy it in bulk. 1) Space. 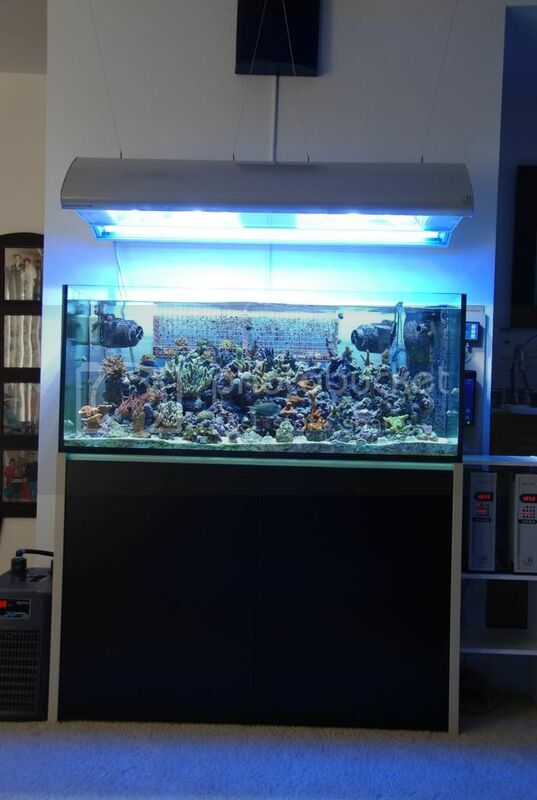 I have limited room under my tank, and if I'm not mistaken, to make the solutions in a volume that would be sensible for a well stocked 72g bowfront (SPS, LPS, Clams) would necessitate 5 gallon jugs which I just don't have room for. The footprint of a reactor and CO2 tank is smaller than the collective space demands of the jugs, dosing pump and whatnot. 2) Simplicity. Mixing that stuff looks to be a PITA, because you have to replenish far more often than with a reactor which only needs to have new media every 8 months or so. It also requires more storage space for the raw materials. 3) Ease Of Use. I'm told that a reactor, if done properly from the beginning, is a "set it and forget it" scenario. Yes, there are a couple more things to factor, but it seems to be the simpler in the long term in that once set up, I don't have to worry about it for at least a half year, where the 2 part system is something that needs to be replenished twice per month. 4) Stability. Looks like the reactor - again if properly set up - tends to have a more long-term stabilizing influence on tank chemistry, such as pH. You also have the ability to control with greater precision the parameters if you're willing to spend money on the probes and controller to do so. 1 - No way you need 5 gallon jugs. A 2 x 5 gallon jugs would last you probably close to 8 months in a fully stocked 72g tank. 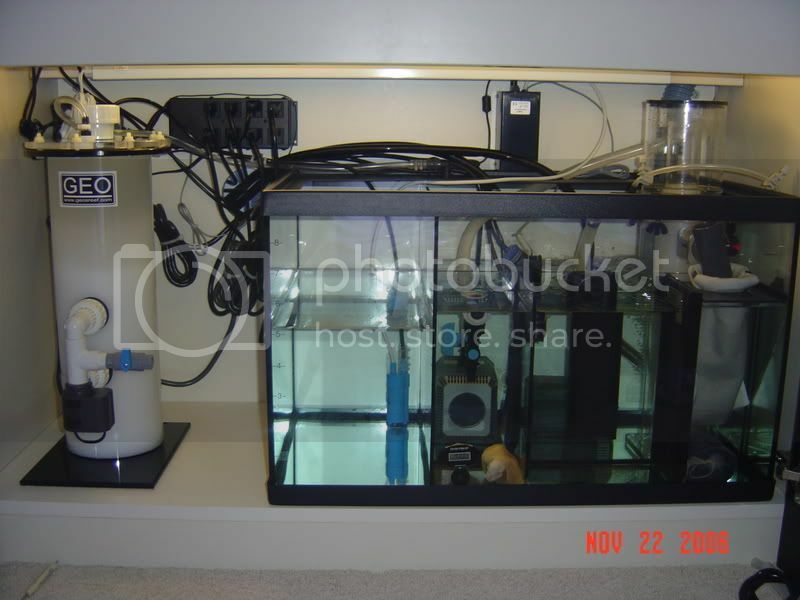 My tank, although only 60g, has high ca/alk demands, and 1 gallon of each lasts over a month, probably closer to 2 months. 2 - You do have to replenish, but replenishing is a piece of cake. I always have a gallon on each on standby. When I'm out, I just pour the "reserves" into my jugs, and I'm done. Takes 2 minutes every couple months, tops. 3 - Definitely not twice per month. A dosing pump was far easier to setup than a ca reactor. Instead of counting bubbles with a stopwatch, measuring alk, bumping the bubbles/effluent up or down, measuring again, monitoring pH, etc., I just set the pump to a set rate, measure, tweak the rate. I found my "sweetspot" in 4 days, vs 2 weeks for a reactor. 4 - Just as stable with 2-part. I actually "prefer" the stability of 2-part + dosing pump, because I don't have to worry about pH going down too much. In a heavily stocked system, you can run issues with pH going too low (too much co2 going into your system). You can always add a second chamber or a kalk reactor, but then you run into the aforementioned space problems again. I suppose it'd help if I mentioned that I've been looking at the Korallin reactor. My understanding is that not all reactors are created equal, and that this one seems to receive positive reviews across the board. I'll consider your thoughts carefully, though I'm still inclined to think the reactor is the better way to go for me. I don't have a calcium reactor but a kalk reactor and dose 2 part. The kalk reactor helps maintains my calcium and pH levels tapped into my auto top off that runs as the water levels in my sump drop. I add 3 shots of alk in the morning and 3 shots of calcium before bed. Seems to be going well for me so far with a heavily stocked SPS tank. Stupid question, with the auto two part you need two pumps right? Or one? Moreover, one good thing about a reactor is you really can't overdose your tank and/or spike the PH too high too fast. I dont know where this fallacy came about, but people frying tanks trying to adjust Ca Rx is pretty common. People frying tanks as their CO2 tanks run out and vent more CO2 is pretty common. I've seen CaRx improperly set up move someone's dkH from 6, to 20 in 24 hours. 2X. That's exactly the reason people hook up their solenoids to pH controllers: in case their reactor malfunctions and spikes pH. The only way I could see an automated 2-part nuking a tank, would be for the user to set the drip rate way too high. Yeah, drip rate is one possibility, or mixing the proportions incorrectly, no? You would really have to be an idiot to mix it incorrectly. 2 1/2 and 2 1/4 cups are 2 1/2 and 2 1/4 cups.......it would be really hard to mess up. Also peristaltic pumps are extremely reliable. I have never heard of a tank crashing from dosing 2 part but have heard many stories of Ca reactors screwing tanks up. As far as the other questions. 2) IMO it's harder to use a Ca reactor...also I mix up 6 gallons of 2 part every 4 months or so. 4) They both are equal at producing stability and even there I would err on the side of 2 part. Like I said before they both work well. If you want a Ca reactor (which it sounds like you do) get one 2 part will work just as well if not better in some people's opinion as posted here and might just save you some $ and make you life easier. You would really have to be an idiot to mix it incorrectly. You'd think it would be really hard to not get salt mixed to the proper SG for a reef tank, but people screw it up all the time. Never understimate the stupidity of mankind. That said, I can definitely see the attraction of a 2 part system. The cost of entry is only a couple hundred bucks at most, but I'm still on the fence. What I find a bit worrysome is that you don't seem to indicate any benefits of a reactor over the dosing system. That's inconsistent with my experience of finding pros and cons for either of two differing methods. While you've listed the pros of dosing vs the cons of a reactor, I haven't seen any of the inverse - the cons of the 2 part solution and the pros of a reactor. Given you considered a reactor yourself, it must have some benefits or you wouldn't have entertained that option. Can you talk about what caused you to entertain the thought of a reactor in the first place? I went to a reactor in the first place because I was dosing 2-part manually at the time, and it was quite a pain. Plus, all of the "big name" reefers were using reactors at the time, so it seemed like the right thing to invest in. Furthermore, I wanted the "wow factor": a bunch of nifty gizmos working in unison.. injecting co2... (I'm a bit of a gearhead). Ok, so help a dumb ol' boy out. If 2-part is so simple and so effective, and reactors are so complicated and risky, why are so many reactors sold at such a significantly increased price premium compared to the 2 part systems? Because Ca reactors are exactly that.... A much more complicated system that require alot of precision instrumentation and additional hardware (bubble counter, CO2 tank, CO2 needle valve and regulator, pH meter, etc...) all this will of course cost more. 1. Some people are really into their equipment and that wow factor. 3. The illusion that having a reactor means less work and maintenance and more stability. Granted I can see the attraction of a reactor if your tank is very large say 300g and larger with a huge Ca demand.